provides resources and services for the Museum, including fund raising, advocacy, and volunteer work ranging from visitor service to restoration and operation of the equipment in its collection. Please consider joining us. To become a member or renew, please click the JOIN NOW button. If you wish to donate online, click here. We appreciate your support. Board Meeting Monday, April 1, 6 p.m. at the Interpretive Center. See agenda. Brimstone & Bat Guano: The Chemistry of the Comstock presentation by Chris de Witt, April 11, 6 p.m.
Egg-stra Special Express coming Easter weekend, April 20-21 from 10 a.m. to 4 p.m.
Ironhorse Camp scheduled Father's Day Weekend, 2019. Click here for more information. Support the Museum and its collection. Buy a brick. 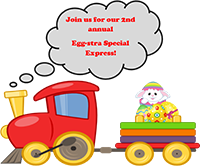 Join the Nevada State Railroad Museum for the second annual Egg-stra Special Express Saturday, April 20 & Sunday, April 21, featuring 1926 Edwards Motor Car rides from 10:00 a.m.-4:00 p.m., egg hunts separated by ages from 11:00 a.m.-3:00 p.m., story time 12:00-2:00 p.m., art activities all day, Easter egg hunt all day (one egg per child) and photos with the Easter Bunny by Storytime Photography (starting at $10). Regular museum admission applies: Adults 18 and over $6, Children 18 and under are free. Regular Motor Car prices apply: Adults 12 and over $4, Children (4-11 years) $2, Children under 4 years are free. A discussion of the chemical demands of the construction of the transcontinental railroad and how these needs were met. The impact of the transcontinental railroad on the lives of the average citizen. Award-winning journalist and filmmaker Min Zhou devoted the past four years compiling the experiences of the Chinese railroad workers into a short film trilogy, Iron Road Builder. A discussion of the new exhibit on the transcontinental railroad and the role artifacts in the Nevada State Railroad Museum’s collection played in it. A recreation of the scene at Promontory Summit when the transcontinental railroad was connected. 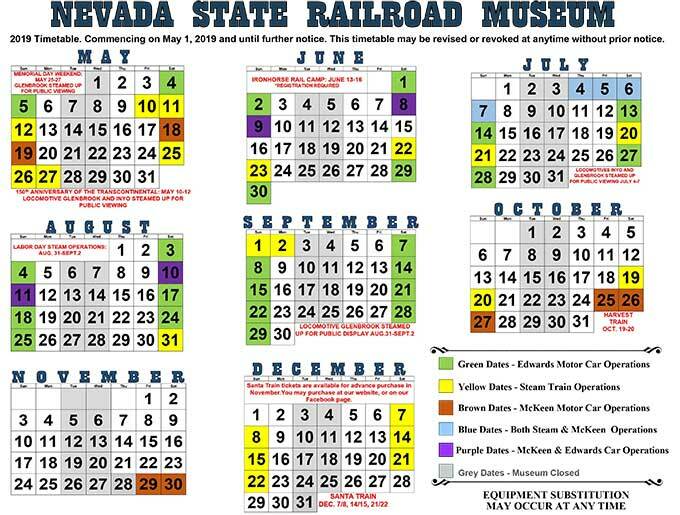 The museum’s locomotives Inyo and Dayton will reprise their roles in the anniversary of the historic date. Watch for the unveiling of the new exhibit which will coincide with the May 10 sesquicentenial of the Golden Spike Ceremony at Promontory Summit in Utah. The centerpiece of the new exhibit will be the only railroad car still existence that was at Promontory on that very day when the railroads came together -- now known as V&T Coach 17, but was the “Commissioners' Car” on May 10, 1869. It carried Central Pacific President Leland Stanford, other Central Pacific officials, and the golden and silver spikes to the ceremony. The exhibit will also feature the V&T locomotives Inyo and Dayton both of which have been used in film and exhibitions to portray the locomtives present at Promontory in 1869.